Until now, biographies of the feminist and anarchist Emma Goldman (1869–1940) have paid scant attention to her three periods of residence in Canada (1926–28, 1933–35 and 1939–40), even though these were some of her most productive years as an activist, speaker and organizer. In the United States, Goldman was notorious as “Red Emma” and “the most dangerous woman in America” because of her advanced anti-authoritarian views. In fact, she was “the world’s most dangerous woman” in the sense that she immersed herself in local issues wherever she was exiled, and was accepted as a public personality to a degree that would seem astounding in today’s mainstream press. 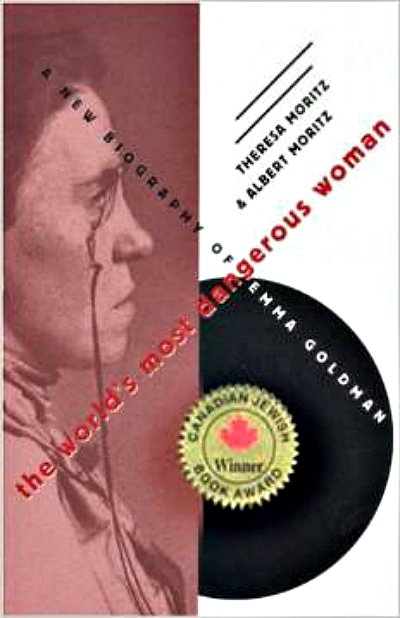 In researching this new biography of Emma Goldman, Theresa Moritz and Albert Moritz have scoured previously ignored private papers in Europe and the United States, and a wealth of indigenous resources long unknown to, or undervalued by, anarchists and feminists. The result is virtually a fresh interpretation of Goldman’s influential and troubled life, and a valuable piece of social history as well. Available used via amazon.ca and other sellers.